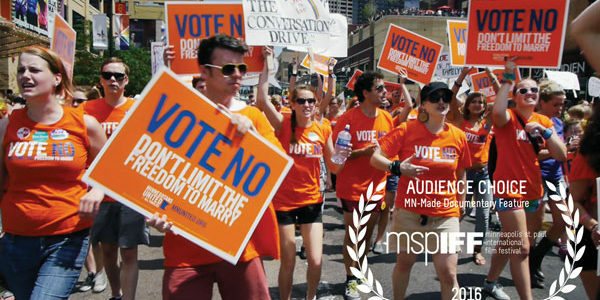 By popular demand, How Love Won: The Fight for Marriage Equality in Minnesota will show three times daily during the upcoming Twin Cities Pride Festival at the St. Anthony Main Theater. Tickets are now on sale for all shows — which start Friday, June 24 and run through Thursday, June 30 — thanks to a special arrangement with the Film Society of Minneapolis St. Paul. Shows are at 1:00 p.m., 5:10 p.m. & 7:20 p.m every day except Monday, June 27, when there is no 7:20 p.m. show. This is the documentary that won the Audience Choice Award for Best Minnesota-Made Feature Documentary at the Minneapolis St. Paul International Film Festival. If you’re one of the hundreds of people who voted for it, please tell your friends they should see it, too! Fear not: many of those tears are happy tears! Still not sure? Watch the trailer.